Druridge Bay is about to become an amphitheatre for a classic battle of ideas and ideologies that that fought over a countryside for hundreds of years. The battle will not in some exquisite Coliseum but down and dirty in an open cast mine, more the scenery for 1970s Dr Who than Gladiator. Banks Mining are about to lodge their planning application for a new open cast between Cresswell and Druridge villages. Look North did a fine job of tracing out the battle lines: jobs, tourism, landscape, wildlife, energy, community, money. Their storyline captured the contested views of what might or might not happen very neatly, a microcosm of environmental debates from around the world. There were firmly held views, with anti-mine protestors dismissed as know-nothing outsiders whilst equally local opponents of the mine worried that alternative businesses would be snuffed out. 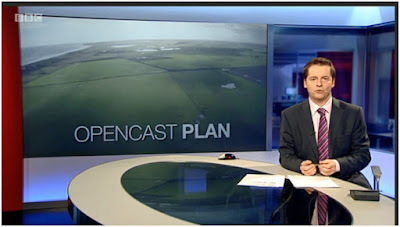 For conservationists the open cast proposal represents a complex and unnerving dilemma. The best wildlife sites along the Bay are restored open cast mines, from Hauxley at the north through East Chevington and Druridge Pools. The potential of a new site, restored as a fine reserve once mined out is obvious. On the other hand that might not be the outcome. Hauxley, East Chevington and Druridge Pools were all handed over to the care of the Northumberland Wildlife Trust or National Trust. Trouble is that Banks do not own the proposed new site and cannot offer this prospect as a definite prize to aim for beyond the short term horizon of mining. I suspect conservationists will be caught in the cross fire, at least in the short term. Fail to oppose the mine and we will be challenged by protestors who can draw on the deep roots of anti-nuclear power and sand extraction campaigns on the Bay. Fail to support the mine and we will be portrayed as anti-jobs, lacking the vision to see the future benefits. I suspect this very blog will haver between these two poles, not least because of both the brilliant potential for a new wildlife site but the deadly uncertainty that it can be delivered. Meantime the light has changed to autumns spun gold, warm in the day but the edge of cold in the air giving the lie to pretending it is still summer.